Incorporating industrial and rustic elements into a space requires the furniture, shelving and lighting to harmonize within the space. This photograph of a Brooklyn loft (Christopher A. Dorsey) perfectly demonstrates balancing these design elements. Featured on Houzz, this loft designed by Alina Preciado incorporated a Pole Supported Rakks Shelving System. This system adds verticality to the space and works well with the industrially-inspired lighting and hanging trapeze bar. The leather couch pillows balance the industrial feel, and three Dar Gitane metal tables provide a heavy, gilded-aged look. 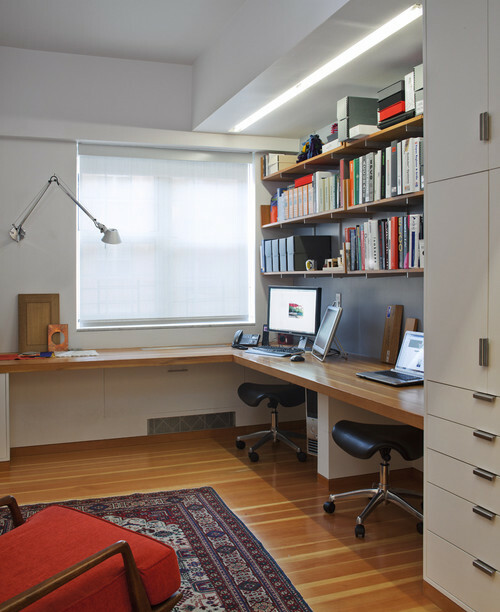 Below is a photograph detailing the transformation of an office within a rustic three-bedroom duplex in Harlem designed by Mabbott Seidel Architecture. This is a more contemporary space: but it uses industrial ideas like open shelving (Rakks Brackets) to better represent a working office space. Industrial elements like this distinguish spaces throughout the home. This Boston-area residence by InTAdesign incorporates a hybrid bookshelf system that blends nineteenth-century wooden boards reclaimed from the house with anodized aluminum components. Hanging open lighting helps connect the bottom and top of the space. Combining the wood and metal elements in the post and beam system perfectly completes the balance between rustic and industrial design execution. Here is another example of furniture, shelving, and lighting working in unison. 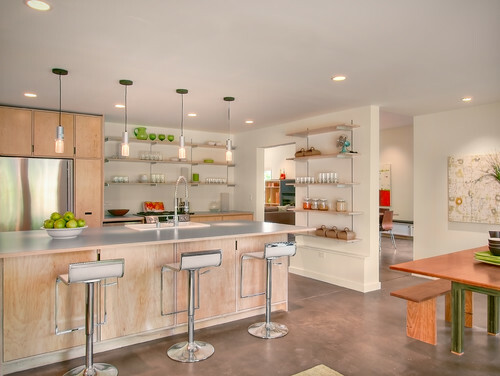 This Seattle-area kitchen designed by Fivedot Design Build incorporates industrial-inspired lamps and stools that contrast perfectly with the rustic kitchen bench and Rakks Shelving System.